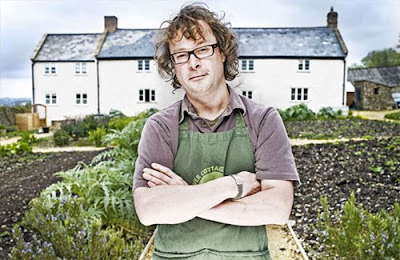 I just finished watching the latest episode of River Cottage...I love it so much! I so wish I lived there. It really does make me want to have my own farm, growing as much food as possible, and having some animals to look after as well. In my dreams, I live somewhere like that, near the sea and with lots of eco technology so that maybe it even starts to sell electricity back to the board. With a little log fire, and a huge Aga in the kitchen. But the closest I come to actually being there is reading the book. The River Cottage Cookbook is full of tasty recipes for natural and healthy dishes. All with a delicious twist, obviously! In proper Hugh FW style. Its inspirational, as well as giving loads of information about self-sufficient living. Even if it is a little pretentious at times, the photography and tasty recipes make it a brilliant recipe book. there are far too many meat recipes in the book for my liking really, and not nearly enough veg recipes to satisfy my cravings. although it's not a go-to book for everyday, it's interesting to read all the information he has about growing food and raising animals, how to prepare and how to cook; it's a very practical guide for anyone who enjoys dreaming about this type of lifestyle, and for those who are already on the path to self-sufficiency. That looks so good! And healthy, too. Huge Furry Whittlingstall is great, got two of his books. The blog is great by the way.